Photo by Emily Schwing, KUAC – Fairbanks. 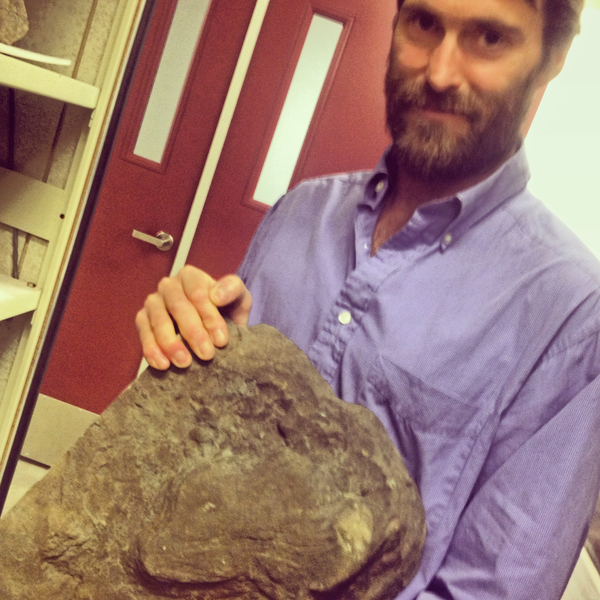 A trip down the Yukon River this summer yielded big results for one University of Alaska paleontologist. “We found a ton of dinosaurs, literally!,” Pat Druckenmiller, the Curator of Earth Science at the Museum of the North, said. He and colleagues floated nearly 500 miles of the Yukon River, where they collected literally 1 ton – or 2,000 pounds – of fossilized dinosaur tracks. It was all shipped by barge from Kaltag back to Fairbanks, where it now awaits further investigation. Druckenmiller leads the way past shelves of specimens in the basement of the Museum of the North. There are whale skulls, giant bones and at the end of one dimly lit row, huge chunks of sand and mudstone. It looks exactly as one might expect a three-toed dinosaur footprint to look. 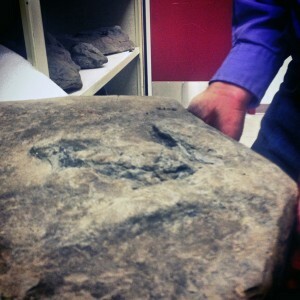 This is one of thousands of preserved dinosaur tracks Druckenmiller and colleagues discovered this summer. “This and all of the other material that we found was just a complete surprise, because no one expected anything like this was out there,” Druckenmiller said. The team put their boats in on the Yukon River at the village of Ruby and floated all the way to Kaltag. Druckenmiller says part of the surprise is that no one in any of the villages they passed along the way knew what was hidden in the river banks. Research into the area’s geology led some of Druckenmiller’s colleagues to believe they might find something. And the effort paid off. 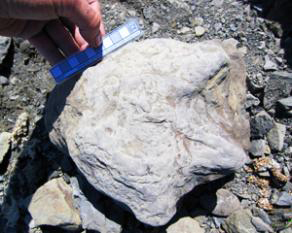 Other evidence of dinosaurs has been discovered along the Colville River on the North Slope and at Denali National Park, but Druckenmiller says these Yukon River fossils are 25 to 30 million years older. 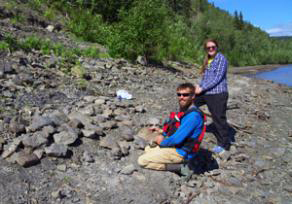 The crew found dozens of dinosaur tracks along one Yukon River beach. Pat Druckenmiller and Katherine Anderson assess some of the tracks. Photo by Kevin May. “That’s interesting because we know climatically that was a warmer period in earth history, Alaska was still farther north than it is today so we know these dinosaurs were living at or above the Arctic Circle when they were alive and because they are older than other tracks in the state we get a sense of how dinosaurs changed through geologic time,” he said. The discovery includes both meat-eating and plant-eating dinosaurs. Druckenmiller can identify some of the footprints based on bones collected from elsewhere in the state. “But in some cases we don’t know what the track maker was and in fact we have a couple of very strange footprints that we are still investigating and might be really exciting when we figure out what they are,” he said. Druckenmiller wouldn’t elaborate. He says a new find like this is extremely rare in the 21st century. The team has many years-worth of work ahead before they can fully tell the story of the dinosaurs that lived along the Yukon River.